Easter in Italy is celebrated by rich traditions celebrating the resurrection of Jesus Christ, the basis of the Christian faith. Easter is celebrated the first Sunday after the first full moon after the spring equinox. The celebrations start on Good Friday before Easter and carries through the following Monday. There are rituals, solemn processionals and masses commemorating the joyous celebration. The parades are often in ancient traditional costumes. Easter in Italy, in many villages, is the beginning of the festival season. In areas like Tuscany, villagers will spend weekends celebrating until September. After the spring housecleaning is done, the local Priest comes to the house to bless it and to bless a bowl of eggs. The egg symbolizes the never ending cycle of life and death and at Easter many egg dishes are served. Popular dishes for Italian breakfast food are the frittata and Easter pie recipes; made with and without sugar. Like most countries, Easter in Italy is celebrated with much traditional Italian food. On the Italian food menu you will always find Easter pie recipes. 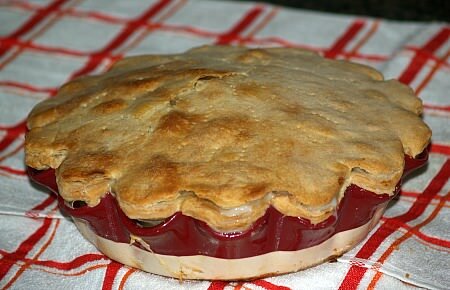 Italian Easter pie recipes can be served for breakfast, but there are many of them made specifically for dessert and served all day long on Easter in Italy. Most of these are known as being Italian ricotta pie recipes but some are also called frittatas like the ham and cheese frittata. The ricotta gives a light taste and texture to the recipe which blends well with meat, vegetables but also fruits and spices sweetened with sugar. There are so many wonderful Italian Easter pie recipes; each family will argue that their traditional one is the best for Easter in Italy. They can be made for a meal or as a delicious dessert. Preheat oven to 400F degrees; brush deep dish pie plate (10 inch size) with olive oil. Wash spinach, drain well and chop; set aside. TO MAKE DOUGH combine flour, 5 tablespoons olive oil and salt in large bowl. Add enough of the water to form stiff dough; knead dough and divide into 10 equal balls. Place balls of dough on a lightly floured tray; cover with damp towel and let stand for 15 minutes. TO PREPARE SPINACH FILLING place spinach in a large pot; cover with lid and cook until wilted. Place spinach in colander and squeeze out excess water; set aside. Melt butter in same large pot; sauté onions until tender. Add spinach to onions and cook about 4 minutes; toss to blend and set aside. TO MAKE RICOTTA FILLING combine ricotta cheese, eggs, pepper, salt, marjoram and Parmesan cheese. NOTE: While preparing keep dough balls covered with damp cloth. TO ASSEMBLE roll 1 ball of dough very thinly, a little larger than pie plate; fit into pie plate and brush with olive oil. Roll 5 MORE dough balls (Making 6 layers) to layer pie plate; BRUSH EACH LIGHTLY with olive oil. 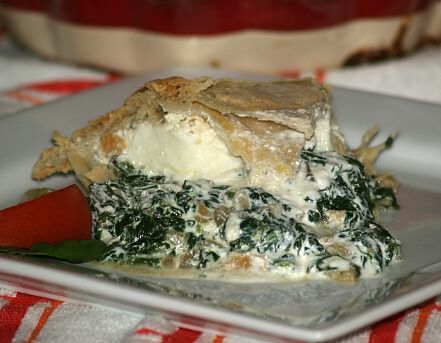 Spread the top of the sixth layer with the SPINACH FILLING; top the spinach with the RICOTTA CHEESE FILLING. Roll out last 4 dough balls and layer on top of the pie; brush each layer with olive oil. NOTE: I place each on the flat surface, brush each with olive oil and after layering, I place all 4 together on top of the pie. Prick top with a fork to let steam out; trim off excess dough and pinch edges to seal. Bake about 40 minutes or until top is golden brown; cut and serve hot. NOTE: I place mine on a pizza tray to bake to catch the “drips”. Mix together cottage cheese, ricotta, ham, Parmesan cheese, 3 eggs, Italian seasoning, salt and pepper. Blend mixture well and set aside. Prepare your favorite pastry recipe; shape 2/3 dough into large ball and shape remaining in another ball. Roll large ball into 16 inch circle about 1/8 inch thick. Fold circle into fourths and carefully lift into 10 inch spring form pan; unfold. With fingers lightly press dough into bottom and on sides of pan; trim pastry to make it even with rim. Brush pastry with some of beaten egg yolk; spoon cheese mixture into pastry lined pan. Fold edges of pastry oven the filling; brush pastry with some of egg yolk. Roll remaining small roll of pastry to a 10 inch circle; with a knife cut desired design in dough. Place pastry circle over filling in pan pressing lightly around to seal; brush top with egg yolk. Bake for 1 hour or until sharp knife in center comes out clean. NOTE: This can be served cold but I like it warm. Carefully remove rim to serve and cut in wedges. Many people will serve a fruit bread recipe for Easter in Italy and other holidays. Combine and mix 1 cup flour, yeast, 1 teaspoon sugar and milk to a smooth batter; let stand until frothy. Stir melted butter, egg and Marsala into frothy batter; add to fruit mixture. Mix to a soft dough; turn out on lightly floured surface and knead until smooth. Cover with oiled plastic wrap and let strand to double in size. Punch down dough and knead until smooth; shape in a ball and place on greased baking sheet. Let rise until double; score cross on top with knife. Reduce heat to 350F degrees and bake 25 minutes longer; cool on rack. The following recipe is often made as a gift on Easter in Italy to the priests. Mix together in a bowl and cut in with a pastry cutter. Stir in the yolk. Work dough with hands an press together in a ball. Press dough evenly in the bottom and up the side of a 9 inch springform pan. Bake for 30 minutes or until golden brown.Cool. Turn oven temperature up to 400F degrees and preheat. Combine milk, rice, sugar, salt and butter over a double boiler. Cover and cook, occasionally stirring for 2 ¼ to 2 ½ hours or until rice is soft. Pour part of mixture into the eggs, and then stir it back into remaining rice mixture. Add almonds and almond extract and stir in. Pour into baked crust and bake for about 20 minutes or until center is firm. I have added this Italian American stew to my Easter in Italy recipes although the origination has been traced to the Italians in California. This is delicious to serve at Easter time. I like to make it for either Good Friday or on Saturday before Easter. Clean or thaw all fish and seafood; set aside. Sauté onion, green pepper, celery, carrot and garlic in olive oil until soft. Stir in tomatoes, tomato sauce, basil, bay leaf, salt and pepper; heat to boiling. Reduce heat, cover and simmer for 2 hours; DISCARD BAY LEAF. Add fish, shrimp, scallops, crab legs; simmer 10 minutes. Add mussels or clams; simmer 10 minutes longer or until done. Ladle into bowls and sprinkle with parsley; serve with fresh Italian bread. This hot side dish with pine nuts and capers makes a great addition to Easter in Italy recipes. Remove and separate broccoli flowerets from stews. Drop broccoli into a 4 quarts saucepan filled with boiling salt water; cook 4 minutes. Rinse under cold water; drain and pat dry. Melt butter in a large skillet; add pine nuts and garlic. Sauté for 30 seconds; remove mixture and set aside. Add the broccoli to the skillet; toss over moderate heat for 2 minutes. Add water; cook over high heat for 6 minutes or until tender crisp. Add pine nut mixture and capers to the skillet; season with salt and pepper to taste. Cook over high heat for 1 minute; serve hot (8-10 servings).